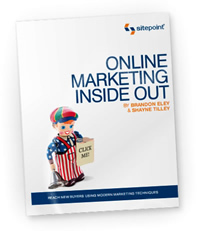 SitePoint has a new book out called “Online Marketing Inside Out” and it’s special to me for a few reasons. First, it’s co-authored by my good friend Brandon Eley, who I’ve known for like 7 of 8 years. The other co-author is Shayne Tilley, who I have talked to many times and like a lot, as well. I’m really happy for them and want it to do exceptionally well for them – I’m sure it will. Finally, I contributed to the book, working as an expert reviewer on a pair of chapters. This marks the seventh book I’ve contributed to in one way or another. My friend Ted Sindzinski served as an expert reviewer, as well. All of that said, I’ve had an opportunity to read a good portion of it and scan various other aspects of it and it’s a great book, highly valuable to anyone looking to grow their online marketing knowledge. Not just that, but the book is also useful for rounding out and broadening online marketing experience you may already have. For example, you may be well versed in social media – but not in e-mail marketing. Or you may be an expert on e-mail marketing, but know nothing about landing pages. The book will help you to become more well rounded when it comes to online marketing. All in all, if you have any interest in online marketing at all, I’d pick it up. You can pre-order a print copy on Amazon.com (I imagine it’ll be shipping soon enough) for $19.77 or you can buy it directly from SitePoint for $29.95 plus shipping ($4.95 in the U.S., $6.95 in Canada and $9.95 to Australia, France and the U.K. and many other countries) and get a free eBook by the awesome Darren Rowse of ProBlogger. The eBook alone is selling for $19.95, so that sounds like a good deal to me. You can also take advantage of the bundle deal if you purchase an eBook copy of “Online Marketing Inside Out,” which will run you $29.95, but will not cost any shipping. (You can get both the eBook and the print book for $39.90 at SitePoint, plus shipping of the print copy). “Managing Online Forums” Coverage Update: Slashdot, SXSW Interactive 2009 and More! In the past four months, since I posted my last book coverage update, I’ve been honored by all sorts of coverage for “Managing Online Forums” and I wanted to take a moment to share the interest that has been shown in this period and thank those that were behind it. 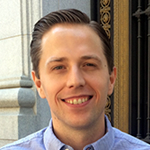 One of the biggest things to happen was the Slashdot review, written by JR Peck of GeekBook. It propelled the book into the top 1,500 books on Amazon.com and kept it in the top 10,000 for a number of days. The Slashdot review was mentioned on the AMACOM Books Blog. There were also reviews by Michelle L. Rodriguez of Mequoda Daily, Rich Villalobos of Cisco Systems, Dr. Natalie T. Wood in the Journal of Consumer Marketing and Richard Millington of FeverBee. The book received it’s first review on Amazon.co.jp, thanks to Kushi-book-reviews and it’s first review on Amazon.fr, thanks to Dominique. I participated in text based interviews with Commania, AdminQuest, Des Walsh dot Com (also posted on the International Blogging & New Media Association website and Mr. Walsh was kind enough to mention the book favorably on his blog, as well) and sparkBB. There were new podcast interviews on Podcaster Training and WordCast. A previously recorded interview on PerfCast was mentioned on the Splashpress Media blog. I attended South by Southwest Interactive 2009 from March 13 through 17 and I gave a book reading (really a presentation around a theme in the book) called “The Art of Responding to Feedback from Your Community”. I also had a book signing at the conference’s bookstore. I spent the signing next to Thom Singer, the author of “Some Assembly Required” and “Some Assembly Required: A Networking Guide for Women,” who was kind enough to mention the book, and some kind words, on his blog. Last month, when I wrote about the potential of Skimlinks, some people had asked me to share my thoughts after I had had the opportunity to use them. For those interested, I’ve been using their program for about a month and have written a full review over at ManagingCommunities.com. “Managing Online Forums” is One Year Old! I’m a little belated in mentioning this, but the publication date of “Managing Online Forums” was April 28, 2008. That means that the book has been in circulation for over a year. Has it really been a year already? The book was and is stocked nationwide at Barnes & Noble stores. It’s cracked the Amazon.com top 10,000 on numerous occasions. It has received a total of 43 reviews on the Amazon international network of stores, including 37 on Amazon.com. It is in at least 223 libraries. I’ve been overwhelmed and flattered by the praise that I’ve received not just on review sites, but also in e-mail, on forums and in person at conferences. I’ve been blessed to have been interviewed countless times for online media, print and even television and to have had the book reviewed by many people of very different backgrounds and levels of experience. I am truly thankful for all of the support that I have received and I have a lot of people to thank. It starts with the people who support me, my family and my friends, like Brandon Eley, Chrispian Burks, Jared Smith and Stephan Segraves, who gave me kind encouragement before everyone else knew I was working on it. My agent, Neil Salkind and everyone at AMACOM who worked on it, from editors to sales people. Thank you to everyone who has reviewed the book and/or invited me into their space to talk or for an interview. This includes Chris Brogan, Jason Falls, Lee LeFever, Rick Villalobos, Jake McKee, Jim Kukral, Thomas Myer, MarketingSherpa, Des Walsh, Shai Coggins, Martin Reed, Michael Kimsal, Richard Millington, Geek Book, Michelle L. Rodriguez, Dr. Natalie T. Wood, Martin Kloos, Jessica Smith, Rob Diana, Kare Anderson, Manny Hernandez, ONLINE, Brad Williams, Heidi Miller, Travis Smith, Liz Fuller, eModeration, Dr. Jeffrey Barlow, Book News, Rico Mossesgeld, James Seligman, Ray Angel, Andy Staple, Vincent Lauria, David Berkowitz, Midwest Book Review, Ramona Iftode, Andrea Hermitt, Jonathan Bailey, Jason Bean , Jeff Henrichsen, James Fintel, Gary Pollock, Miranda Marquit, Ken Davidoff, Douglas Bell, Ethan Kwassman, Wendy Piersall, David Askaripour, Zack Urlocker, Douglas Hanna, Blake Thompson, John Wilkerson, Jim Turner, David Lewis, Jerry Stephens, Christa Casebeer, Joel Trigger, Jon Scheiber, Pete Carr, Chris Matthieu, Aric Cabot Hoek, Ahmad Jordan, Anne Marie Nichols, Marcquis P. Knox, Sniff Code, Ryan Zieno, Duncan Rawlinson, Edwin Vaughan, Danielle Williams, T. Hooper, Juana Pacheco, Brian A. Pomeranz, Simon Peter Lewis, Matt Whiting, P.J. Dixon, Mrs. K A Rowland, Catherine Archer, Kushi-book-reviews, L. Sutton, sparkBB, AdminQuest, Commania, BloggerTalks, Urban Lifestyle Report: New Media, Blog World Expo, Josh Klein, Performancing, lefora, LIVE Interviews Online, Bill Johnston, Website Magazine, Pete Prestipino, The Daily Advance, Talk Social News, Wayne Sutton, Kipp Bodnar, BlogTalkRadio, WordCast, Alejandro Reyes, The Tech Buzz, Scott Fox, WebProNews, Social Medialogy Conversations, Zane Safrit, New Media Pro.TV, Startup Spark, WordPress Weekly, Fitness Business Radio, WITN, Heather King, Meet the Experts, Inside Digital Media, Thom Singer, Lynn Terry, Esther Schindler, Blogs.com, Barbara Rozgonyi, Gwen Bell, Connie Bensen, Slashdot, Bradley Kelly and so many others. And I can never thank everyone who has supported me or the book. But, if you have purchased the book, worked on the book, helped spread the word, stocked the book, liked it on FriendFeed, mentioned it on Twitter, bookmarked it on delicious or helped it to reach more people, from the smallest gesture to the largest, please accept my sincere thanks. I really appreciate it and the support means a lot to me. Yesterday, I published “Bad Boy Blog’s 10 Tips for Getting the Most Out of Twitter for Bad Boy Artists, Promoters, Employees and, Yes, Even Diddy” over at Bad Boy Blog. Yes, that is quite a title! Heh. At any rate, the site is Bad Boy focused and I got the idea to write the article from watching Bad Boy artists, marketing people and others participate on Twitter. But, really, by extension… it’s 10 Twitter tips for anyone in the music industry that is wanting to get more out of Twitter. But, for the most part, it’s also tips that will help anyone who is at least relatively new to Twitter and there might even be a morsel or two for those who have been using Twitter for a while. So, if you’re looking to enhance your Twitter experience, please give it a look and let me know what you think! Thanks.